Emmanuel Macron had no chance of winning the presidential election. Every textbook on French politics or contemporary history will tell you so. He had no chance, and he seized it. 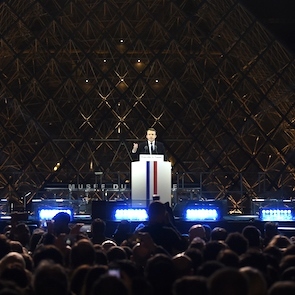 After his first large-scale rallies, in Strasbourg in October 2016 or in Paris in December, all serious commentators indulged in gentle mockery. Partly because his voice went shrieking like a radio football reporter at the 1998 World Cup final, partly because of his vocabulary. At that time, he tended to describe his ideas as ‘disruptive’, an adjective borrowed from the current Silicon Valley discourse. It turns out that now that he does no longer use the word, he has indeed become a major ‘disruption’ in the long history of French democracy. So many rules that seemed graved in stone need to be erased from the textbooks. 1. 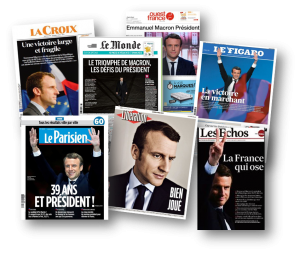 A French president can only be hard-boiled veteran politician toughened by numerous election campaigns, having earned his ‘presidentiability’ over a long period of time in major functions. Persons under 40 who never stood for any election on any level should refrain for fear of being ridiculed. 2. Within the framework of the electoral system of the presidential election under the Fifth Republic and the resources that are required for a successful election campaign, it is only possible to envisage a candidacy in earnest with the backing of an established party, firmly rooted in constituencies across the nation. ‘Exotic’ candidates from outside the party spectrum may be tolerated to amuse the audience in the first round before being ejected when serious things start. 3. The left-right dichotomy – which he French invented in the first place – is so fundamental to French political culture that even smart, sympathetic and widely appreciated centrists like Jean Lecanuet or François Bayrou may only create an ephemeral illusion, but are condemned to fail eventually. 4. Because of a massive and irreversible semantic shift over a significant period of time, a candidate wishing to build a presidential majority shall by no means use the adjective ‘liberal’ to describe his or her fundamental beliefs or economic orientations. In case the label is conferred by the media, he or she shall consistently deny it. There is no majority for liberal values. 5. Due to the Gaullist dogma of national sovereignty, the tendency of each and every successive French government to blame economic failure on ‘la Commission de Bruxelles’, and the refusal of French mainstream media to engage with Europe, this most boring of all possible topics, there is no way to lead a successful nation-wide election campaign with and explicit and ostensible commitment to the European Union, European symbols and underlying European values. Of course, as all the French papers I had the opportunity to consult today at Charles Gaulle airport (of all places!) pointed out in their rather well-balanced and pertinent analysis of yesterday’s disruption, Emmanuel Macron benefitted tremendously from unforeseeable, unprecedented circumstances. Of course, the entire squad of his major rivals all were either ousted before even being able to run – Juppé, Sarkozy and Valls in their respective primaries – or kind enough to sabotage themselves irremediably – Hollande with his stupid revelations book in the crucial phase last autumn, Fillon through the Penelope affair and even more through his handling of it, and Marine Le Pen in a surrealistic television debate. And of course, many of the votes he obtained were only given to him with the aim of barring Le Pen. Not to mention the incredibly high number of ‘active abstentions’ in the form of 4 million so-called ‘blank votes’, which indicates that his programme and the reforms he envisages are not very likely to have the support of 66% of the French citizens. All this is true. Still, he did it. 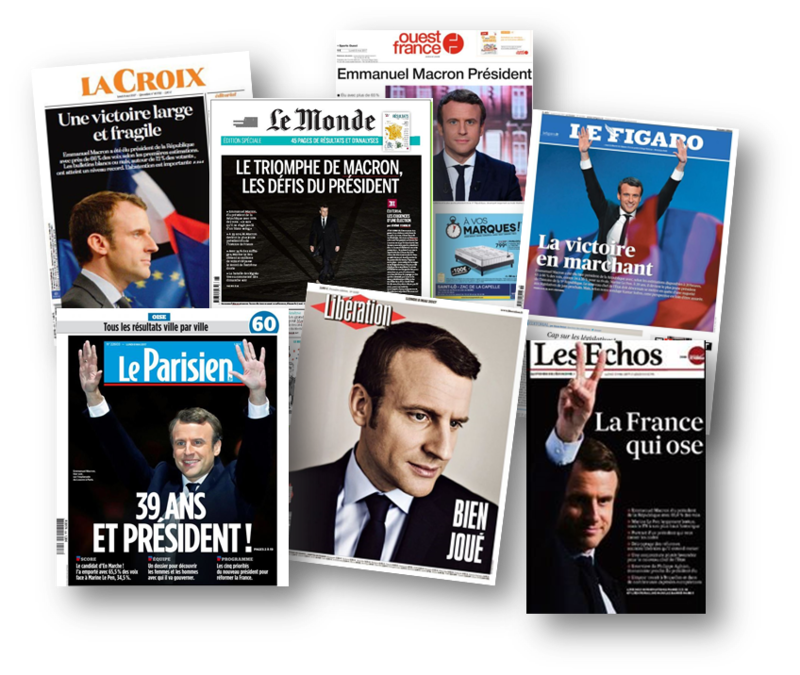 As Nathalie Kosciusko-Morizet frankly acknowledged on television last night: ‘it is impossible to remain insensitive to his achievement’. There is, however, no time for admiration, since the historical feat will not be worth much if Macron does not succeed in repeating the same accomplishment over again. He does not have any real power so far, and the legislative elections, as argued earlier in this blog, may well turn him into a ‘fake president’, eclipsed by a more or less hostile parliamentary majority. The latter will be formed after a highly intensive five-week campaign during which he will face staunch resistance from all established parties who are eager to put him back in his place. Let’s face it: it is not possible to win 289 seats in the parliament from zero, with a bunch of mostly unexperienced candidates. It would be a major disruption. He has no chance whatsoever to obtain a majority. Every textbook will tell you so! This is post # 21 on the French 2017 election marathon. This entry was posted in Current Affairs, Democracy & Citizenship, Global & International, Politics & Public Policy, Society & Culture and tagged Emmanuel Macron, France 2017, French culture, French elections, French politics, legislative elections, presidential elections. Bookmark the permalink. Next: France 2017: The end of ridicule?